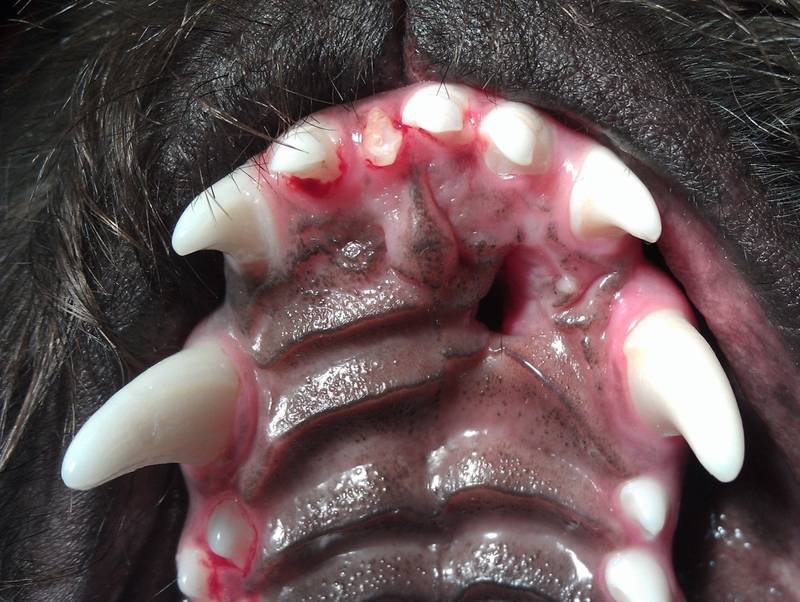 Oronasal fistulas are a common clinical presentation for Dr. Kressin, and other veterinary dental specialists. 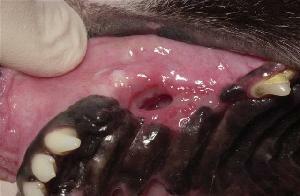 Oroantral fistulation is less common however, an important problem for companion animals. What is an oronasal fistula? Oronasal fistula near dental Close up view of oranasal fistula. Hair was impacted into the respriatory tract. An oronasal fistula is a communication between the oral cavity and the anterior respiratory tract. Oronasal fistulas occur most commonly in the area of the upper canines, and with less frequency in the incisor region. Food and oral fluids perculate into the respiratory tract. The result is respiratory tract inflammation and infection. What is an oroantral fistula? An oroantral fistula is a communication between the oral cavity and the caudal respiratory tract. These fistulas occur in the area of the upper fourth premolar and the molar teeth. What is the cause of oronasal and oroantral fistulas? The loss of integrity of either the incisive, maxilla or palatine bones, results in the fistula. Preiodontal disease is an infectious, progressive and destructive process typically responsible for these fistulas. Trauma, especially from bite wounds or dental extraction, are also common causes for oronasal and oroantral fistulas. How can oronasal and oroantral fistulas be prevented? Oronasal and oroantral fistula formation can best be avoided with a team approach consisting of the owner (in providing daily teeth brushing), the family veterinarian and Dr. Kressin, the dental specialist. Early diagnosis of periodontal disease is accomplished by the primary care veterinarian performing periodontal probing and in taking dental radiographs during professional teeth cleaning procedures. This early diagnosis allows for early and appropriate periodontal therapy. This is a case of an oronasal fistula that developed as a result of a traumatic occlusion caused by a base narrow canine. Notice the food material found in the oronasal fistula. Due to the location, this is a very challenging oronasal fistula to close. The closure was done in two steps. The first step was to extract several teeth and allow this to heal before closing. 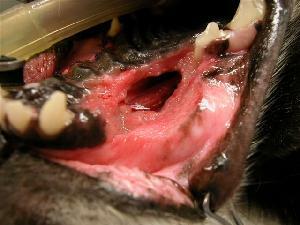 Dog; oronasal fistula as a result of trauma. due to incisive bone necrosis (death). the fistula. Suture; 4-0 Monocryl. the surgical defect could not be closed. "Jabba"; an oronasal fistula was evident. "Jabba"; closer view of right oronasal fistula. "Jabba"; intra-op view of respiratory tract. "Jabba"; right oronasal fistula closed. 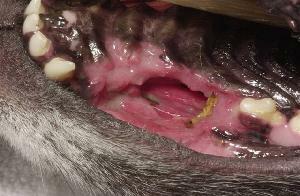 For "Jabba the mutt", a 15mm periodontal pocket at the palatal aspect of the left upper canine confirmed the owner's suspicion of an oronasal fistula on both sides. 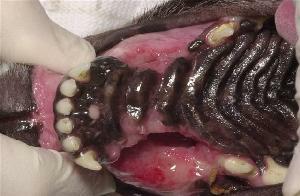 Dachshunds frequently develop bilateral oronasal fistulas secondary to periodontal disease. It is critically important to examine these pets carefully. When periodontal pockets are diagnosed early, periodontal therapy can be performed to avoid oronasal fistula formation. The procedure is called "guided tissue regeneration". long after a canine tooth was extracted. tract discharge and gross contamination. All of the premolar teeth were extracted. Both oronasal fistulas were closed. with draining eyes and nostrils. maxilla and to repair the oronasal fistula. Recovery was very impressive for Blackie! resolved after the oronasal fistula repair. 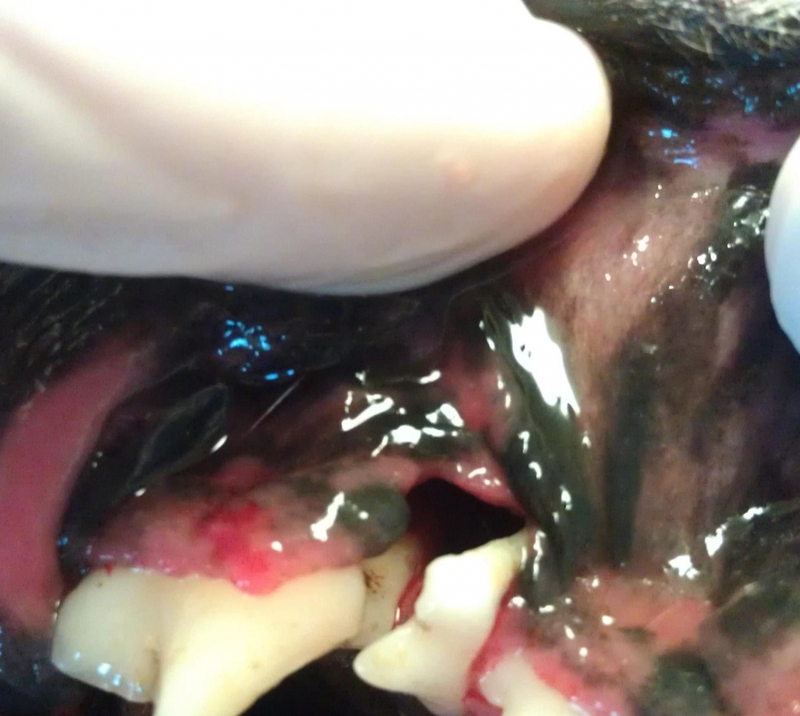 This pet had a large hole (fistula) located between the third and fourth premolars. 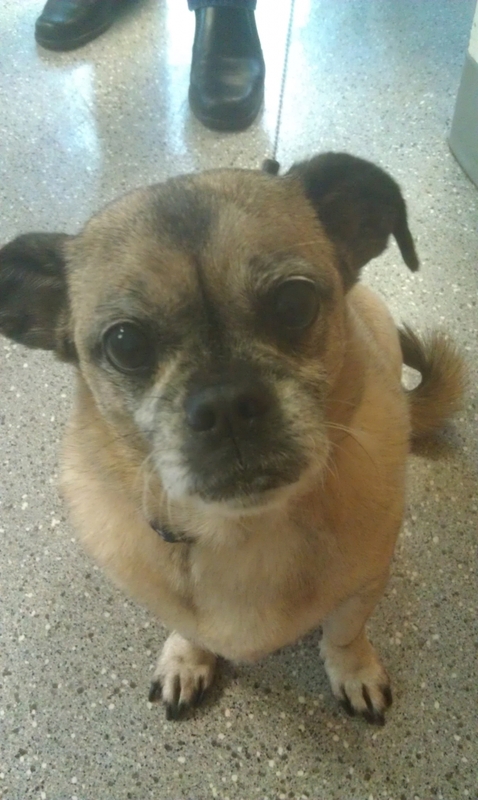 Dr. Kressin has treated oronasal and oroantral fistulas in many cats and dogs. In cats or dogs with chronic (long term) oronasal fistulas, the repair can be particularly difficult especially when previous surgeries have been performed. The first attempt to repair these lesions is the best opportunity for success. We see many oronasal fistulas especially in the Dachshund, and other smaller dog breeds. 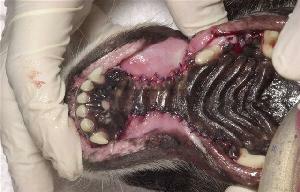 In cats with chronic periodontal disease and alveolar osteitis, it can be difficult to close the canine tooth extraction sites. Failure to close these sites often results in oronasal fistulation. Never wait to see if these sites will heal by "granulating in" because they don't. Earlier attempts to repair these defects offer the best prognosis. 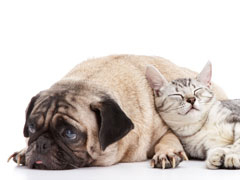 We enjoy working as a team with you, your pets and your primary care veterinarians.